Why buy Acuvue Advance Plus cheap Acuvue contacts. 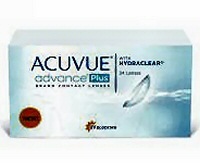 Is it the same lens as Acuvue Advance with Hydraclear? I've been wearing Acuvue Advance with Hydraclear 1-2 week disposable lenses for the last 6 years and just this week noticed that Johnson and Johnson have just brought out a new improved version called Advance PLUS. Is it the same lens? Yes, more or less, except that they've improved the lens as it now has ULTRA CLEAN technology to resist build-up of fatty deposits and dirt on the lenses. More importantly, they're now available in a value for money 24 pack size, saving you $$$ on an annual or 6 month supply. Here's what the new packaging for Advance Plus looks like. A single box retails at $19.95, slightly higher than the normal single box price for ordinary Advance Hydraclear, although even a single box is currently on sale at AC Lens for just $17.96 (at Aug 2011). But if, like me, you prefer to order a year's supply to save money buy buying multipacks, the new 24 pack size of Acuvue Advance Plus is a real bargain. Currently on sale as at Aug 2011 at AC Lens at just $59.36 per box of 24 lenses (normal price is $65.95), when compared to a single box of ordinary Advance Hydraclear at $17.96/box of 6, you save 17% per lens. I was planning to try out the new Acuvue Oasys contact lenses,, but now that my usual Hydraclear contacts have been improved AND I can get them at an even cheaper price, I think I'll just make a note to order the new Advance Plus contacts next time I need to place an order. Tip: Above prices are special offers for Aug during the Sale, but after that you can use one of these special contact lens coupon codes from AC Lens to save money off the new Acuvue Advance Plus contacts.